Markets are higher this morning after the Chinese cut reserve requirements in an effort to stimulate their economy. Bonds and MBS are flattish. The ISM Milwaukee Index improved to 55.2 from 50.4, while the Chicago Purchasing Manager index fell to 47.6 from 55.6. Pending Home Sales fell 2.5% in January, according to NAR. A dearth of inventory continues to weigh on the market. The corporate bond market is having difficulty digesting new issuance. Over the past 12 months, there have been 75 “no go” days, where the primary market was essentially shut. This is higher than the bad old days of 2008-2009. High Yield is even worse, with issuance down 75% year-over-year. When the stock and bond markets disagree, go with what bonds say. Unsurprisingly, asset managers continue to rotate out of stocks and into bonds. Warren says don’t worry, be happy. Also the annotated version of the annual letter. What are the characteristics of houses that sell quickly? Spanish architecture and 1,500-2,000 square feet. Originator and servicer Walter Investment reported lower than expected earnings this morning and the stock is down about 10%. for 2015, originations were up 36% and the servicing portfolio increased by 4%. In the fourth quarter, origination volume was up 8% YOY. Walter wasn’t the only company to miss this morning: Ocwen also is down about 11% after missing its quarter. Delinquencies rose to 13.7% from 13.1%. Stocks are flat this morning on no real news. Bonds and MBS are up. Initial Jobless Claims came in at 272k, an increase of 10k from last week. Durable Goods orders rebounded smartly after a terrible December. They were up 4.9%, way better than the Street expectations. Capital Goods orders rose 3.9% as well. Capital Goods orders are a proxy for business capital investment, so whatever turmoil is happening in the financial markets doesn’t seem to be affecting Main Street, at least not yet. House prices rose 1.4% in the fourth quarter, according to the FHFA House Price Index. 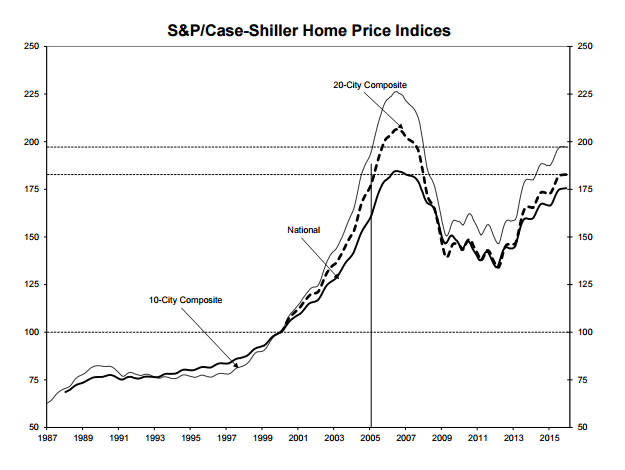 Home prices have now surpassed their bubble peaks and are making new highs. Note that this index is a sub-index of the real estate market – it only looks at homes with conforming mortgages, so it excludes all cash distressed sales and the jumbo market. 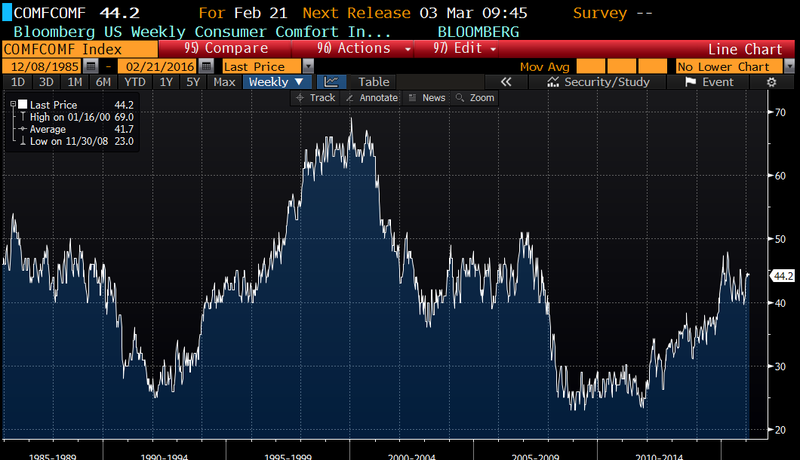 In other economic data, the Bloomberg Consumer Comfort Index fell slightly last week to 44.2. Consumer comfort is crawling back to the bubble days, but still is lower than the Big 90s when the stock market bubble was raging. One thing that is apparent in this election cycle is that it is hip to bash big business. Why won’t they fight back and tell their side of it? In essence, they dismiss the current populism as so much heated campaign rhetoric and believe that when the election is over, it is back to business as usual. FWIW, they have scored some big victories with the Ex-Im bank and the TPP trade deal. Wall Street, for some inexplicable reason, continues to be content with being a punching bag. Realtor.com lays out the 20 hottest real estate markets in February. Cliff Note version: mainly California. The Northeast is deader than Elvis. The Atlanta Fed lowered their Q1 GDP estimate to 2.5% from 2.6%. Stocks are lower this morning on fears of another yuan devaluation. Bonds and MBS are down. Home Prices continued to rally in December, according to the Case-Shiller Home Price Index. They were up 0.8% on a month-over-month basis and up 5.7% on a year-over-year basis. 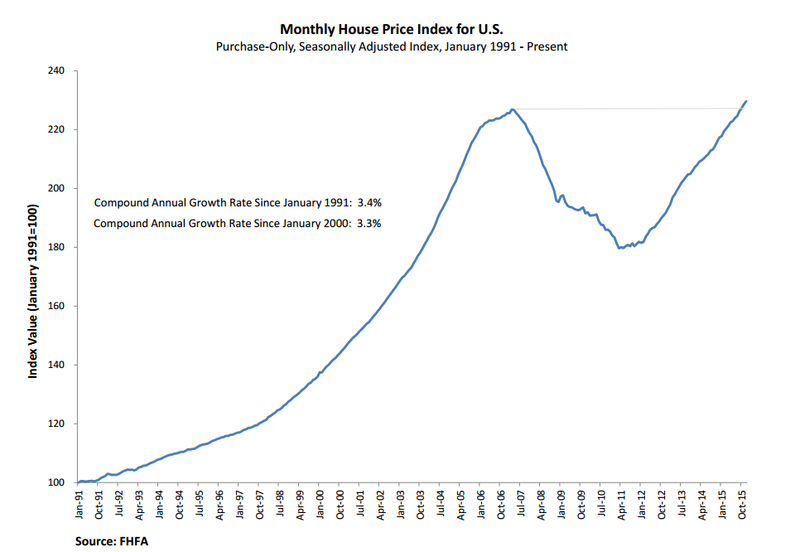 Prices remain about 11.5% below their July 2006 peak. Note the FHFA House Price index which we will get on Thursday is already at new highs. Existing Home Sales were up 0.4% at 5.47 million units in January, according to the National Association of Realtors. On a year-over-year basis, they are up 11%, the biggest gain in 3 years. The median home price rose 8.2% year-over-year to $213,800 as supply constraints continue to drive up prices. Housing inventory is 1.82 million units, which represents a 4 month supply. A balanced market is more like 6 – 6.5 month’s worth. Ultimately, the big price increases are unhealthy because incomes have yet to really exhibit growth (although that may be changing). The median house price to median income ratio is roughly 3.8x, using the median income data from Sentier. 3.3 – 3.7x which is about normal. Speaking of home supply, McMansion builder Toll Brothers reported earnings this morning. Revenues were driven again by an 11.7% increase in average selling prices and not by unit growth. Gross margins fell, which speaks to increasing costs. So far this February, deposits and contracts are flat with last year. The decline in stocks probably has a lot to do with it as the luxury buyer is going to be more sensitive to asset prices than the first time homebuyer. Interesting to see this dynamic with the builders – a reluctance to build more units despite higher prices. Interestingly, CalAtlantic (the new name for Standard Pacific and Ryland after their merger) is bringing back the buydown loan. In other economic news, consumer confidence slipped in in February, and the Richmond Fed Manufacturing Index both fell. Blackrock is warning clients that the Fed is not likely to sit out the rest of 2016, the way the Fed Funds futures markets are predicting. Efficient market theorists might scoff at that notion, however the interest rate markets are so manipulated by central banks at the moment it makes sense to look at market signals with a jaundiced eye. What does that mean to mortgage types? Make hay now, because no one knows how long these low rates are going to stick around. Speaking of credit markets, the new subprime – auto loans – are beginning to exhibit signs of trouble. Auto loans are being priced like mortgages, however a mortgage is secured by a generally appreciating asset, while an auto loan is secured by a depreciating asset. This is the result of financial repression, which is the act of pushing interest rates to the floor. Investors who have to earn a return (like pension funds and insurance companies) are forced to move further and further out on the risk curve to earn their required return. The actuarial tables really couldn’t care less that interest rates are zero. Donald Trump looks to be cruising to a third consecutive victory in Nevada. The big question for the D is whether he is a plurality winner or a majority winner. Once the establishment coalesces around one candidate will he continue to lead? One other interesting tidbit: Democratic turnout for the primaries is pretty depressed. Republican turnout is huge. Kind of pokes a hole in the media’s attempt to create a Bernie Sanders movement, doesn’t it? Real Average weekly earnings increased 1.2% in January. Inflation at the consumer level was flat month-over-month and up 0.3% YOY. Ex food and energy, it was up 2.2%, which is the highest level since June of 2012. 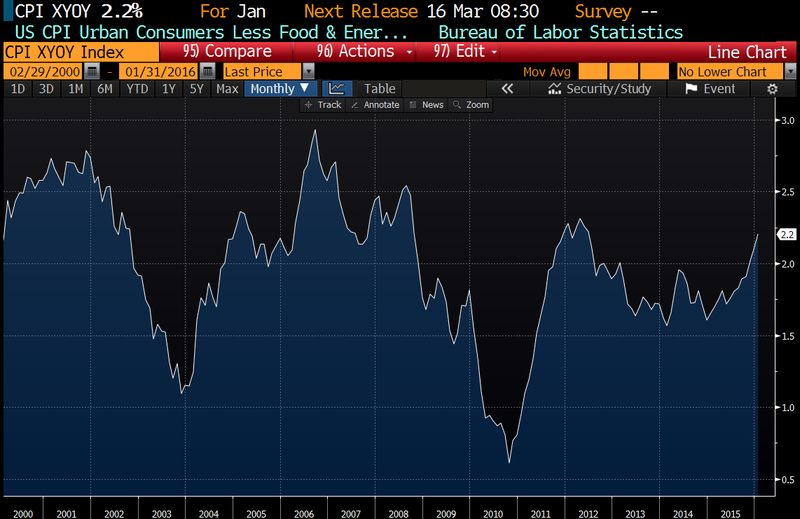 This would indicate the Fed is actually getting there as far as its inflation target. That said, the Fed prefers to use the Personal Consumption Expenditure index, which is still below their target. Good explanation of why the markets and the price of oil have become positively correlated. Old timers might remember back when an increasing oil price was a bad thing. Punch line: the banks have a lot of exposure to the energy patch and are lugging debt that made sense at $60 a barrel, but not at $30. That said, energy companies have issued $5 billion in equity secondary offerings this year, which is a surprise. The appetite is there, at least for some investors. The thinking behind negative interest rates, explained. European economists give their take on it. Basically they work well in smaller. open economies as a lever to manipulate foreign exchange rates, but they aren’t all that effective for larger economies which are trying to boost inflation and growth. In other words, they might work for Denmark, but probably won’t do much good here. Japan recently went negative, so that will be a good test of that theory. Housing affordability is getting a little better as rates fall. Unsurprisingly, the Rust Belt and the Northeast are the most affordable, while California remains the worst. Note San Francisco is proposing transfer taxes for luxury properties in order to address affordability. Between rich tech workers and Chinese investors, property prices in San Francisco are sky-high. There is legislation afoot to eliminate the caps on VA loans, which will make them much more popular in high cost areas. Basically it will become a no money down jumbo. It has passed the House, and the prospects are good in the Senate and the WH. Initial Jobless Claims fell from 269k to 262k., while the Philly Fed improved to -2.8. The Bloomberg Consumer Comfort Index fell slightly to 44.3 from 44.5 the prior week. The Economic Expectations index fell markedly from 47 to 42.5. The Index of Leading Economic Indicators improved slightly in January from -0.3% to -0.2%. Mortgage Delinquencies fell from 4.99% to 4.77% and foreclosures fell from 1.88% to 1.77% in the fourth quarter, according to the MBA. The FOMC minutes were released yesterday, and for the most part they were a non-event as far as the markets were concerned. The Fed did spend some time talking about the slowdown in China, and the reverberations in the markets. A number of officials are beginning to think the inflation forecasts are too high. In addition, the stresses in the financial system act as a tightening even if rates go nowhere. The Fed seems to be setting the stage for a cut in the GDP and inflation forecasts at the March meeting, as well as a pause in tightening. Separately, the OECD took down its forecast for global growth to 3.0% from 3.3%. Mortgage REIT MFA Financial reported earnings this morning. They continue to position their portfolio of MBS more towards credit risk and less towards interest rate risk. When the private label securitization market comes back, REITs like MFA will be the big buyers of non-QM paper. Their appetite for non-agency MBS will be the key driver bringing back the widespread use of products that don’t fit in the agency box.